High PageRank and Alexa Rank are important to those accepting paid post from the direct advetisers. For years, I am trying my best to increase my PageRank and so far so good. I am no SEO expert so I have a hard time ranking my sites. I may not have PR3 or up yet but I am working on it by following other bloggers tips. Hopefully, something positive will happen. Site PageRank depends a lot on the number of unique pages linking to your site. A high number of back links, can expect a high PageRank as far as I know. Here are the few tips that I learned through blogging. I love visiting other blogs and make sure to comment. Take the initiative to comment on other blogs. Commenting is one of the easiest way to increase blog traffic. Be an active commenter and you will have a bigger chance to inrease the PageRank. Blogging is really about building a community with your readers and fellow bloggers. Commenting is a great way to build backlinks, expose your site, and connect with other bloggers. Google + count is one of the major factor affecting the page rank.Google + aims to improve the quality of the Google search results. Search engine results page (SERPS) are determined by the number of Google + counts. Google + will no doubt improve the sites traffic. Create a twitter account to connect with friends and co blogger, install a twitter widget in your blog post for tweet. Twitter delivered traffic, guest writers and backlinks to our site. Promoting posts was a secondary aim. Submit to Search Engine Directories. I am not always doing it, but I heard that submitting the site to search engine directories increase your chances at being listed higher on popular search engines, a good way to get a free link to your website. The more links you have the higher your PR will be. Writing and publishing articles to another sites can generate new traffic. Make sure to include your name and blog URL in your article. By guest posting you will get exposure for your work, get traffic and back links. Write and post articles producing unique content not commonly found on other blogs. Google, other bloggers and readers loves unique content. These kind of articles are the most highly trafficked and linked to posts on the site. One of the most popular way of increasing traffic is through social syndication like Stumbleupon, Pinterest, Digg and more. Create an account to connect with other bloggers. As I have said, I am not an expert on this matter, I am just a mommy blogger trying to increase the Page Rank. If you have additional information that could be of help to other bloggers or much better way to explain how to increase the PageRank, feel free to comment here. Thanks for the tips. It looks easy but it's hard work. If I focus on syndication alone, it takes up most of my day and blogging, at least for me, takes a few hours to write and proofread and format. I'm hoping my PRs improve soon. Thanks for these tips. I've have a good alexa rank but a low page rank but I just did on with the syndication and adding quality post as well as upgrading old post so I got a ratings upgrade. thanks a lot for the information, I wonder though, if we leave comments using our profile, are we not skipping backlinks for our site/blog? I however still comment using my blogger's profile, since i am usually lazy to enter name, url, email, etc. I wonder what is best. thanks a lot for this article madam tess. I dont know whats my PR now. hehhe, hoping for more tips. thanks for this article..this works!i can attest!slowly but surely, my blog has been leveling up based on my alexa ranking..but how do i check its ranking in the philippines?does anyone know how? Very nice post. I really learned lot of things from this page. I think most important in seo is on-page work and website text must be unique. I just love to write, other things follow but it helps having these in mind. Thank you for summing them up. Great post, thanks for the tip! I really wanted to get my pagerank higher but know what to do until I read your post. This is great for those bloggers out there who are looking forward to have a higher pagerank and more traffic! thank you for the informative post about increasing page rank mommy. of all this, the most important thing of blogging is to know how to be constant in publishing posts and that it is in line with your site's niche. Until now I still don't know how to use stumble upon. I find that site so complicated. So far I've done almost everything mentioned above like being active in commenting, in g+ and so on, except doing guest posts to other blogs. Hopefully, I can still get higher page rank. Urg, Pr1 on my blogs hasn't changed for years. these are good points but really, no one knows how exactly Mr. G shares pagerank. Although the info that you gave can help but there's no guarantee. Even expert SEO didn't know how they can earn PR's. 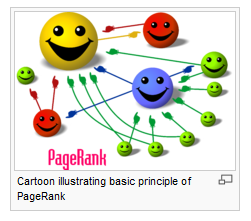 Don't you think that if everyone knows how to get pagerank Mr. G will like it? it's hard to earn one and we get lucky if we get it. Informative post. Somehow I still can't get how google PR ranking works :-) I currently doing the tips you listed and hopefully it will pay off in time. honestly, until now i don't have any idea on how my pr 3 blogs suddenly become n/a, i tried to inquire from google but they did not give me any reply yet. I believe it should have fall atleast into pr1 or something, considering the fact that its alexa ranking is always below 500k. I am trying my best to lower down my Alexa Rating and it works really well. I am just not sure about Google Page Rank as google do change algorithms every time. ive done all this stuff and i am still not successful with GOogle Page Rank. I sure dont know why... 2 of my blogs is still PR 0 and its about to expire soon. Id been updating it all the time but still.. no avail. even my other active blogs. hayz... i think google is retarded. hahahaha.. just kidding sis. Constant update I believe also helps. And such topics must be relevant to the overall theme of the blog. I want to increase my PR so bad thank you sa tips! Hmmmm, tried this before but lost all my pr instead. Now, i never go beyond PR1. But hopefully by being active in linking up and hopping i'll gained back the rank i wanted. So, fingers cross! Good tips and reminders though. Thank you for the tips. I will try doing some of these because I really want my blog to have a page rank.